Summary: Great book – both for GIS concepts and for teaching Python libraries. Lives up to the boast on the front cover – you really will learn to create complete mapping applications, learning a lot of useful tools and techniques on the way. Before I start this review I should probably point out that I am a PhD student working in Remote Sensing and Geographical Information Systems, so I expected to know a fair amount of the theory in this book. The reason I wanted to read it though, was to learn how to do this analysis using Python and its associated libraries. 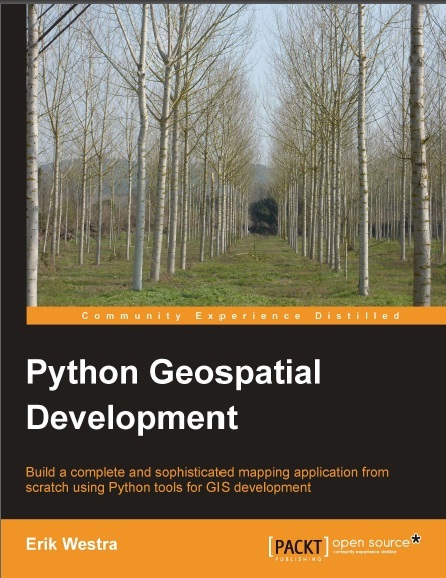 This book succeeded in teaching me how to use Python to perform geospatial analyses, and actually taught me a significant amount of wider GIS knowledge which I had not picked up through any of my university courses. The book is divided into four main sections: the first introduces general GIS concepts, the second explains basic GIS operations in Python, the third shows how to use databases with geographic data and the fourth combines all of the previous information into two GIS web-apps. It is always difficult to work out what level to pitch this sort of book at – as a number of potential readers will already have experience with GIS (and are using the book to learn about doing GIS analysis in Python, like me), but some will be complete beginners who want to introduce map-based analysis into their applications. The first few chapters of this book are pitched nicely at a mid-point between these two reader groups: the author explains things clearly and precisely without seeming patronising. Although I already knew much of the basics, I found the section on projections and co-ordinate systems very useful as I had never properly understood these (I’d always seen the different options in software I was using for Projected Co-ordinate Systems and Geographic Co-ordinate Systems, but I never knew the difference until I read this book!). The next section explains how to use a number of Python GIS libraries such as GDAL/OGR, PyProj, and Shapely. The author starts with a general description of the capabilities of each library, and continues with a ‘cookbook-style’ approach showing how to do various tasks with these libraries. For example, instructions are given for how to convert projections and calculate Great Circle Distances with PyProj, how to extract shape geometries and attributes from shapefiles using OGR and how to do basic GIS analysis with Shapely. Details are given on joining these libraries together to exchange data between them using the very useful Well-Known Text (WKT) format – a format that I hadn’t come across, but which appears to be very useful. This section finishes by putting together a number of these libraries to do some real-world tasks such as identifying parks near urban areas. The third section focuses on geodatabases – an area I know very little about. This section gives a good overview of the concept of a geodatabase, and then specific details about three geodatabases: PostGIS, MySQL and SpatiaLite. I was pleased to see that three contrasting databases were chosen, and a good listing of advantages and disadvantages of each was given. After introducing the workings of these databases, code examples for linking them to Python are given, starting from basic queries and going right up to complex spatial analysis performed within the database. A geospatial application (called DISTAL) is then implemented, showing how to combine geodatabase access with the GIS analyses explained in the previous section. This is implemented as a web-application, but previous experience with web programming is not needed as it is implemented using simple Python CGI scripts, and there are sidebars explaining terms that the reader may not have come across before. The fourth section is by far the most complicated, and deals with producing maps using a library called Mapnik and producing geo-enabled web-applications using GeoDjango. I must admit that I didn’t quite follow all of this chapter, although this is probably because I’m not hugely interested in, or experience with, building web-apps. In some ways a little too much emphasis is made of how to do things using Django – and trying to introduce any web-app framework (be it Django, Ruby on Rails, or anything else) in one chapter is a tall order – and not enough on the GIS, but I can see why the author included it – as it brings together a fair amount of the tools covered in the book into one coherent whole. Overall, I’m very impressed with this book. If I had my way (and you never know, if I end up as a lecturer one day I might…), I’d make Chapter 2 part of the core reading for any GIS course, as I am completely shocked that it covers areas that I have never covered even when doing Advanced GIS courses at degree level! I should mention that as well as the chapters mentioned above there is a useful chapter on sources of geospatial data (which, again, mentioned sources that I’d not heard of), and a comprehensive index which makes it very easy to find things. The instructions on how to use the Python libraries (and, more importantly, how to join them together) are well-written and comprehensive and the introductions to GIS concepts are pitched at just the right level. I would thoroughly recommend this book for any GIS or geospatial data user for two main reasons: firstly, it gives great introductions to GIS concepts they may not have come across, and secondly, knowing how to do these things in Python can make certain jobs so much easier (how about a 10 line Python script rather than a few hours of repetitive data conversion?). GIS Datamthat you may find useful as well.